To set the stage for the remainder of the offseason, we’ll take a look at the most pressing remaining needs of every team in baseball over the coming week or so, division by division. (Hat tip to MLBTR commenter mike156 for the idea.) We often discuss things through the lens of an organization’s trajectory; thus, a rebuilding team might “need” to move some salary, while a contender might “need” an expensive starter. But with camp in sight, every club is making final calls on who’ll compete for big league jobs in the season to come (while also pursuing broader opportunities), so the focus here is on specific positions on the MLB roster. Fortunately, the task of roster analysis is made much easier by the MLB depth charts available at RosterResource.com. Each team listed below is linked to its respective depth chart, so you can take a look for yourself. Bullpen: With Mark Melancon gone, the Nationals are currently projected to rely on Shawn Kelley (11 career saves) as their closer. Based on his output the past couple seasons, Kelley is worthy of the role, but there are durability concerns with the soon-to-be 33-year-old. Kelley has never thrown more than the 58 frames he tossed last season; more alarmingly, he’s a two-time Tommy John surgery recipient who, per a study done by MLBTR contributor Bradley Woodrum, comes with an elevated risk to eventually need another procedure. Even without Kelley’s injury history, acquiring relief help is in order. Washington got a combined 242 2/3 innings last season from Melancon, Yusmeiro Petit, Felipe Rivero, Matt Belisle, Jonathan Papelbon, Reynaldo Lopez and Marc Rzepczynski. Not a single one of them is a member of the organization anymore. Therefore, it would make sense to add at least one more veteran to the likes of Kelley, Blake Treinen, Sammy Solis and Oliver Perez. The club already tried to re-sign Melancon and reel in Kenley Jansen, but those attempts failed. Even with those two off the board, free agency is hardly bereft of options. In the event Washington decides to stick with in-house choices, it has a couple intriguing youngsters in Koda Glover and Trevor Gott. Infield Depth: The Nationals’ infield depth took a hit with the loss of Danny Espinosa, and current free agent Stephen Drew could also be in another uniform next season. Either re-upping Drew, which is a possibility, or signing another veteran would give the team more proven insurance than Wilmer Difo (77 career plate appearances) behind second baseman Daniel Murphy, shortstop Trea Turner and third baseman Anthony Rendon. Murphy is capable of playing first base if Ryan Zimmerman endures another poor year or suffers an injury in 2017, but that would leave the team wanting at the keystone. Rotation Depth: In trading Lopez and Lucas Giolito to the White Sox for outfielder Adam Eaton, the Nats subtracted some of their starting pitching depth. That’s somewhat concerning given that starters Stephen Strasburg and Joe Ross are coming off injury-plagued years, which perhaps increases the need to add rotation insurance behind those two, Max Scherzer, Tanner Roark and Gio Gonzalez. A.J. Cole and Austin Voth might suffice thereafter, but there’s very little of intrigue beyond them (Double-A prospect Erick Fedde could crack the major leagues sometime next season, granted). The Nationals had an established veteran starter in camp last year in Bronson Arroyo, who ended up missing 2016 because of injuries, and could look for a similar depth option prior to next season. Outfield: There are only two corner outfield spots, yet the Mets arguably have four starting-caliber players on hand in Yoenis Cespedes, Curtis Granderson, Michael Conforto and Jay Bruce. Cespedes isn’t going anywhere, obviously, and Conforto’s place on the roster appears secure. The writing is on the wall, then, for either Granderson or Bruce (very likely the latter) to exit the organization via trade by next season. The Mets have been reluctant to deal Bruce without getting anything useful in return, but they might have to settle for dumping his salary in order to clear their corner outfield logjam and free up spending room. In doing so, New York would still face uncertainty in center field. Juan Lagares has fallen off since a strong 2014 showing that led the Mets to sign him to a four-year extension with $23MM in guarantees. Cespedes and Granderson also have experience in center, but neither is an ideal fit there. The Pirates’ Andrew McCutchen has come up as a trade possibility, but he was a defensive nightmare last season and the Mets aren’t actively looking to acquire him (or any other center fielder), anyway. Right-Handed Reliever: The Mets are going to lose closer Jeurys Familia to at least a month-long suspension, which will leave the team with Addison Reed and Hansel Robles as its go-to choices to preserve late leads. Mindful of that, general manager Sandy Alderson has checked in on the likes of Wade Davis (before the Royals traded him to the Cubs), Brad Brach (Orioles) and Alex Colome (Rays) on the trade front this winter, but nothing has materialized. White Sox closer David Robertson represents another possible acquisition, though he’d be a costly pickup. There are still appealing names on the open market, where Greg Holland, Joe Blanton, Sergio Romo, Santiago Casilla, Neftali Feliz and 2016 Met Fernando Salas are among those without contracts. Left-Handed Reliever: New York has three lefty relievers on its projected 25-man roster in Josh Edgin, Josh Smoker and Sean Gilmartin, but none had encouraging 2016 campaigns (in fairness to Edgin, he was on the rebound from 2015 Tommy John surgery and finished the year well). Jerry Blevins was terrific last season, but he’s now a free agent and, along with Boone Logan, one of the top two southpaw setup men left in free agency. The Mets have shown interest in each this offseason, but payroll limitations have prevented them from signing either (presumably, they’ve also stood in the way of securing right-handed help). Starting Pitcher: Forced to forge ahead without the late, great Jose Fernandez, the Marlins have made a couple unexciting additions to their rotation this winter with the signings of Edinson Volquez and Jeff Locke. They now have a full starting five on paper with those two joining Wei-Yin Chen, Adam Conley and Tom Koehler, but it’s not the most confidence-inspiring group. With that in mind, Miami is still in the market for a starter, though it’s seemingly limiting itself to low-cost depth types. Luckily for the Marlins, there are plenty of those left in free agency. First Base: As long as they’re facing a right-handed pitcher, the Marlins are in fine shape at first base with Justin Bour. But, in an admittedly small sample size of 110 major league plate appearances, the lefty-swinging Bour has struggled mightily against southpaw hurlers (.223/.273/.291, no home runs). Thus, it would behoove the Fish to find a better platoon partner for Bour than the penciled-in Miguel Rojas – although a righty, he has posted a woeful .184/.225/.272 line versus lefties in 122 PAs. Any of Dae-ho Lee, Mark Reynolds, Trevor Plouffe, Adam Rosales or 2016 Marlin Chris Johnson could be realistic targets via free agency. Miami hasn’t closed the door on re-signing Johnson, who – despite a subpar 2016 – has historically held his own against lefties. Left-Handed Reliever: It’s not a must for the Marlins to find a southpaw reliever, as their most prominent righty options – A.J. Ramos, Brad Ziegler, David Phelps, Kyle Barraclough and Junichi Tazawa – are capable of getting all hitters out. Nevertheless, it would be nice for the club to have more than one left-handed reliever on its 40-man roster. As of now, only Hunter Cervenka is in the fold, though same-sided batters hit a paltry .198/.306/.318 against the then-rookie last season. Signing a free agent like Javier Lopez could make sense; even though the longtime Giant’s coming off a season to forget, he has a lengthy track record of success preventing runs and would like to remain close to his Georgia home. Third Base: Their interest in Brian Dozier notwithstanding, the Braves appear to have a respectable offensive platoon lined up at second base with Jace Peterson and Sean Rodriguez. On the other side of the diamond, finding a complement to right-handed-hitting third baseman Adonis Garcia would be beneficial. Garcia has hit an underwhelming .262/.293/.407 in 152 trips to the plate against righties, while reserve Chase d’Arnaud (also a righty) hasn’t done any better (.218/.278/.278 in 279 PAs). Free agent Luis Valbuena is a potential fit, but he’s an upgrade over Garcia in general and would warrant an everyday role. Otherwise, the aforementioned Stephen Drew – a left-handed hitter and Georgia native – could be a reasonable free agent target to pair with Garcia. Bullpen: As it stands, the Braves’ sole 30-something reliever is closer Jim Johnson, with Arodys Vizcaino and Ian Krol serving as only semi-established options. While it’s quite possible the Braves are comfortable with a mostly young bullpen that will also include Mauricio Cabrera and Jose Ramirez, among others, signing one of the many available veterans on a short-term deal would have a chance to pay dividends over the long haul. For example, the Braves could take a similar approach to last year’s Padres, who bought low on Fernando Rodney, got a few good months out of him and flipped him for a prospect prior to the trade deadline. That’s assuming the Braves aren’t contenders next year, of course. Catcher: With Tyler Flowers and Anthony Recker in the equation, this arguably isn’t a pressing short-term need for a rebuilding club, but free agent backstop Matt Wieters is nonetheless on Atlanta’s radar. It’s debatable how much of an upgrade (if at all) the ex-Georgia Tech star would be over Flowers, though. Wieters, unlike Flowers, is not a well-regarded pitch framer, and the longtime Oriole is coming off one of his worst offensive seasons. If Atlanta doesn’t land the switch-hitting Wieters, it’ll likely be content to roll with Flowers and Recker next season. Corner Outfield: The Phillies’ most proven corner outfield bat belongs to Howie Kendrick, who has played 1,100 games at second base compared to just 114 in left field and is coming off a below-average offensive year. While the rebuilding club could simply utilize Kendrick and younger players like Roman Quinn, Aaron Altherr and Tyler Goeddel (the latter two were dreadful in 2016) next season, dipping into free agency for another outfielder remains a possibility. If general manager Matt Klentak does sign anyone, odds are it’ll be a left-handed hitter. Of the previously mentioned four, only the switch-hitting Quinn is capable of batting from the left side. Bullpen: Klentak has revealed he’s looking for more relief help, though he has already been busy on that front throughout the offseason. Philadelphia has acquired three stopgaps in Joaquin Benoit, Pat Neshek and Sean Burnett (on a minor league deal), but its projected major league bullpen could stand to make improvements beyond Benoit, Neshek, Hector Neris and Jeanmar Gomez. Left-Handed Starter: The Phillies’ starting five at the moment features nothing but right-handers, and Adam Morgan is their only Triple-A starter who’s a southpaw. Perhaps it would be logical to sign a swingman like Travis Wood, who could initially work out of the bullpen (joining fellow lefty Joely Rodriguez) and then potentially factor into the rotation if someone suffers an injury or underperforms. Unsung Zeroes breaks down the ramifications of the newly minted collective bargaining agreement. Jays From the Couch blames Edwin Encarnacion’s agent for the first baseman/designated hitter’s departure from Toronto. Camden Depot ponders the future of Orioles center fielder Adam Jones. Real McCoy Minor News chats with Indians outfield prospect Bradley Zimmer. The 3rd Man In interviews highly touted 2017 draft prospect Royce Lewis. When Sid Slid praises the Braves for their work this winter and looks ahead to next offseason. Pirates Breakdown (links here) identifies potential bargain outfielders and relievers for the Bucs to target in free agency. MLB451 wonders if anyone is today’s game is capable of finishing a season with more home runs than strikeouts. Call To The Pen suggests a few moves that would help the rebuilding Padres return to relevance in the coming years. Chin Music Baseball sees striking similarities between the Mets and Indians, two World Series hopefuls. Bronx Bomber Blogger discusses the Yankees’ offseason in a podcast. The Point of Pittsburgh analyzes the Pirates’ young, in-house rotation options. Jays Journal writes that drafting and developing relievers could be the next competitive edge in Major League Baseball. BirdsWatcher tries to determine how much it would cost the Orioles to extend second baseman Jonathan Schoop. Notes from the Sally previews the 2017 Charleston Riverdogs, the Yankees’ South Atlantic League affiliate. Now On Deck and Rotisserie Duck present their mock Hall of Fame ballots. Fake Teams offers a two-round mock fantasy draft. Sports Talk Philly doesn’t expect Mike Trout, a New Jersey product who grew up a Phillies fan, to ever play for the club. Everything Bluebirds argues that the Blue Jays should be wary of trading with the Rockies. Outside Pitch MLB opines that the lack of a market for free agent catcher Matt Wieters could benefit the Nationals. Die Hard NYY regards free agent first baseman James Loney as a logical Yankees target. Call To The Pen previews a few positions that will be up for grabs for the Phillies during spring training. North Shore Nine revisits the top 10 moments of the Pirates’ 2016 season. Pinstriped Prospects credits the Yankees for the amount of undrafted players positively impacting their system. The Runner Sports looks back fondly at former major league right-hander Darryl Kile, who died in 2002. The Royals could have interest in Pedro Alvarez. The free agent would essentially replace Kendrys Morales in Kansas City’s lineup, providing the Royals with some left-handed hitting thump from the DH spot. The Rays and Red Sox have both shown interest in Alvarez this offseason, though he has been most heavily linked to a return to Baltimore, perhaps as a possible fallback option for the Orioles if they can’t re-sign Mark Trumbo. A utilityman, a reliever and a low-cost starting pitcher are the remaining items on the Royals’ shopping list. Cafardo suggests that Jason Hammel is a potential candidate for that rotation need, as the Royals “could wait out” a market that has seen around 10 teams (including the Marlins and Yankees) express some interest in the veteran hurler. Cafardo feels K.C. is probably done trading impending free agents after the Wade Davis deal, so Lorenzo Cain, Eric Hosmer and Mike Moustakas will all play one more season and then test the market next winter. The White Sox have received some “due diligence” calls about Todd Frazier, though Jose Abreu is receiving more attention. Abreu is controllable for three seasons while Frazier can be a free agent after 2017, so the differing levels of interest aren’t a surprise. Frazier hit a career-best 40 homers in his first season in Chicago, though his overall hitting numbers (.225/.302/.464, 102 wRC+) rated him as providing just slightly above-average offensive production. A .236 BABIP could’ve contributed to that downturn, not to mention the fact that it was Frazier’s first year in a new league, though it’s worth noting that Frazier has delivered just a .306 OBP over his last two seasons. Frazier turns 31 in February and MLBTR projects him to earn $13.5MM in 2017, his last season of arbitration eligibility. The Dodgers reportedly had interest in Frazier earlier this winter, though that was before L.A. re-signed Justin Turner as its regular third baseman. Cafardo doesn’t get why the Blue Jays, Red Sox and Orioles all seem to have reservations against signing Jose Bautista, arguing that Bautista can be a huge lineup upgrade for all three teams. In regards to Bautista’s injury-plagued 2016 season, Cafardo notes that the slugger still posted good numbers amidst his injuries “and has a chip on his shoulder” to re-establish himself after that down year. Money could prevent a reunion between Rajai Davis and the Indians, Terry Pluto of the Cleveland Plain Dealer writes. The Tribe would like to bring back the veteran outfielder, though there isn’t any payroll space after Cleveland went above and beyond their financial comfort zone to land Edwin Encarnacion. Pluto thinks Davis could only come back to the Tribe if he fails to drum up enough interest from other teams, though that seems unlikely given his still-excellent baserunning. It’s worth noting that the Orioles are the only team known to have interest in Davis’ services this winter, so if his market continues to be quiet, it wouldn’t seem to be out of the question that Davis returns to Cleveland next year. In a recent piece about the Blue Jays and Jose Bautista, Richard Griffin of the Toronto Star cites Brett Gardner as one of multiple “trade avenues to explore” for the Jays before they would considering re-signing Bautista. The Yankees are known to have received some interest in Gardner this winter, and this is the first time Toronto has been linked to the veteran, though Griffin’s comment could imply more a due-diligence type of a check-in on the Blue Jays’ part rather than a solid interest. Gardner’s overall hitting numbers declined in 2016, though he still checks a lot of boxes for the Jays as a good on-base threat and leadoff man, a left-handed hitter and an excellent baserunner and defensive left fielder. The 33-year-old is owed $25MM in guaranteed salary over the next two seasons. A complicating factor, of course, could be the fact that the two teams are division rivals — the Blue Jays and Yankees haven’t collaborated on a trade since 2002. The Twins have some leverage in shopping Brian Dozier since, as the slugging second baseman is under contract for two more affordable years, Minnesota can simply keep Dozier in the fold if it can’t find an acceptable trade offer for him this winter. In his latest subscription-only column, ESPN.com’s Buster Olney warns that waiting to find a perfect deal for Dozier is something of a risk for the Twins, as Dozier’s value may never be higher than it is right now. Dozier is prone to extended slumps (he hit very poorly in the last two months of the 2015 season and in the first two months of the 2016 season) that could lower his trade value if he gets off to another slow start. Also from Olney, he opines that “it seems inevitable” that the Red Sox will be looking for (ironically) a Clay Buchholz-like pitcher in trade talks, if not necessarily re-acquiring Buchholz himself from the Phillies. Boston dealt Buchholz two weeks ago in order to get his salary off the books for luxury tax purposes and to alleviate a seeming rotation surplus. With Eduardo Rodriguez suffering another (apparently minor) injury to his surgically-repaired right knee and Steven Wright and Drew Pomeranz also carrying injury concerns from last year, there are certainly some questions about the last two spots in the Red Sox rotation. Third Base: Boston is hoping that a healthy and in-shape Pablo Sandoval can get back to his old Giants form, though that’s no small risk given Sandoval’s disastrous 2015-16 seasons. With Travis Shaw off to Milwaukee, the Sox are left with Brock Holt and Josh Rutledge as the primary third base backup options on the MLB roster. The Red Sox didn’t hesitate to bench Sandoval after he struggled in Spring Training last year, so if he has another rough spring, the Sox could start looking for a reliable everyday option at the hot corner. Bench Depth: While the Red Sox have several backup options on the 25-man roster or high minors, WEEI.com’s Rob Bradford recently pointed out that the team is rather lacking in proven depth pieces, and might not be able to handle an injury to one or two regulars. Adding the likes of an Adam Rosales or Trevor Plouffe (names cited as Bradford as players of interest for the Sox) would help in this regard. Left-Handed Reliever: The club’s decision to tender a contract to Fernando Abad was something of a surprise, given how poorly Abad fared after joining the Red Sox last summer. Robbie Ross is the primary lefty in Boston’s bullpen and while it appears the Sox feel Abad will get back on track, it wouldn’t hurt to find another southpaw. Admittedly, this is a pretty borderline “need” on what is a pretty stacked Boston roster — the Sox could potentially find another lefty reliever internally in the form of Roenis Elias, Brian Johnson, Henry Owens or perhaps even one of Eduardo Rodriguez or Drew Pomeranz (if Steven Wright reclaims a rotation spot). Corner Outfield: With Jose Bautista and Michael Saunders both in free agency, the Jays are left with Melvin Upton Jr., Ezequiel Carrera, new acquisition Steve Pearce and Dalton Pompey as the candidates for both left and right field. You could argue that this counts as two needs, though the Blue Jays can juggle their internal options at one corner spot and focus on acquiring an everyday outfielder to handle the other position. Left-Handed Reliever: Southpaw bullpen depth has been a long-standing need for the Jays, who were short on lefties even before Brett Cecil signed with the Cardinals. The team has been linked to several left-handed relievers in free agency, though given the big contracts scored by Cecil and other lefties this winter, landing one of those notable arms won’t be cheap. Toronto has added left-handers T.J. House, Brett Oberholtzer and Jeff Beliveau to minor league deals this winter, though a more proven southpaw reliever would certainly be preferred. Right-Handed Reliever: No reason to stop at just southpaws, as the Jays’ relief corps is pretty thin behind Roberto Osuna, Jason Grilli and Joe Biagini, and it could get thinner if the Jays explore stretching Biagini out as rotation depth. The Jays are looking to duplicate their success with Biagini in another Rule 5 draft pick (Glenn Sparkman) and have a few new faces added in the minors to join their in-house bullpen options. As with the lefties, however, adding an experienced, reliable arm would go a long way to solidifying the bullpen. Right Field: With a Hyun Soo Kim/Joey Rickard platoon planned for left field, the Orioles have considered several free agents and trade targets for the right field slot. This doesn’t necessarily have to be an everyday option, as the O’s could form another platoon out of a new addition and one of Christian Walker, Aneury Tavarez, Adam Walker or Dariel Alvarez. With rookie Trey Mancini in line for a significant amount of DH at-bats, however, the Orioles may hesitate at allotting quite so much playing time to inexperienced youngsters. Designated Hitter: While the O’s are high on Mancini, it makes sense to add a veteran who can at least serve as a platoon partner should Mancini not be ready for prime time. Baltimore has been linked to free agents like Chris Carter or Pedro Alvarez for DH duties, though ideally, Mancini’s DH partner would also be able to handle playing a corner outfield role, so two needs could be addressed at once. Left-Handed Hitter: If the Orioles do add another bat, some left-handed pop would be preferable to add balance. Kim and Chris Davis are the only left-handed hitters projected to get regular playing time in the current Baltimore lineup. Starting Rotation: Masahiro Tanaka, Michael Pineda and C.C. Sabathia aren’t the most rock-solid top three in the world, though they’re locked in atop the Yankees rotation. That leaves Luis Severino, Chad Green, Luis Cessa, Bryan Mitchell and perhaps Adam Warren battling for those last two spots. There isn’t a lot of experience in that group, and GM Brian Cashman has downplayed the idea of acquiring another starter (though the Yankees have also been linked to Jose Quintana in some trade rumors). As much as the Yankees want to see what they have in their young arms, it wouldn’t be a surprise to see them add a low-cost, innings-eating veteran to compete for a rotation job in Spring Training. Left-Handed Reliever: Aroldis Chapman will close and Tommy Layne is a classic LOOGY, so since Joe Girardi likes to have as many bullpen options as possible, that leaves room for another southpaw. Chasen Shreve, Richard Bleier and Dietrich Enns are options on the 40-man roster, though since the Yankees have been connected to veterans like Boone Logan or Jerry Blevins on the rumor mill, they could be looking for more experience. First Base: As in the rotation, the Yankees are committed to young players at first, with Greg Bird penciled in as the starter and Tyler Austin getting some action against lefties (veteran Matt Holliday could also fill in, in a pinch). While Bird is reportedly recovering well from February 2016 surgery to repair a torn labrum, you have to consider a position a bit of a question mark when the first choice is a player returning from missing an entire season. It’s very unlikely the Yankees will make a move to address first base before Opening Day, though it could be an area to watch as the season develops if Bird, Austin or Holliday have injury or performance-related setbacks. Starting Rotation: While the Rays already have plenty of starters, what they really “need” is to decide if they’re going to be dealing one of them. Rumors have been flying all winter about teams looking to acquire one of Tampa’s starters, with Drew Smyly or Alex Cobb perhaps more likely to be on the move due to the Rays’ reportedly enormous asking price for Chris Archer or Jake Odorizzi. What the Rays get in return for one of their arms (if any are dealt) will go a long way towards filling one or both of the remaining needs on this list. Right-Handed Hitter: Left fielder Corey Dickerson and first baseman Brad Miller are both left-handed bats who struggle against southpaws, so the Rays would be aided by adding a player who can handle one (or both) positions and add some thump from the right side of the plate. Designated Hitter: This would also be a natural spot for a right-handed bat, as switch-hitter Nick Franklin was only effective against righty pitching last season in part-time action. A regular DH isn’t necessary since the Rays would like to keep this position open for lineup flexibility — Wilson Ramos will likely require some DH time in the wake of knee surgery, while neither Dickerson or Miller have much defensive value — but the promise of DH at-bats could help the Rays entice a veteran hitter who might be otherwise unenthusiastic about playing on Tropicana Field’s artificial surface. Blue Jays talking with Jose Bautista. The slugger’s rather unusual spin through free agency could lead him back to where he started, as Bautista has been in “active contract discussions” with the Jays about a return. Bautista is apparently willing to discuss accepting a one-year deal from the Jays or other teams, though that one-year pact would still need to pay him beyond the $17.2MM value of the qualifying offer. Mike Napoli’s market heats up. 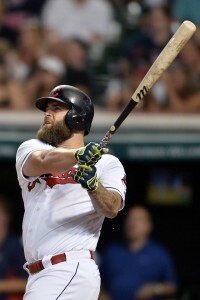 The free agent first baseman has seen his market pick up in recent days, with the Rangers perhaps in the driver’s seat. Texas is discussing a two-year contract with Napoli, though some other teams (reportedly the A’s and Orioles) are still in the mix. Twins asking for final trade bids on Brian Dozier. After a winter full of trade rumors about the slugging second baseman, Minnesota is reportedly looking to wrap up the process, asking interested teams to submit their best and final offers for Dozier’s services. The Dodgers have long been seen as Dozier’s most ardent pursuers; the Braves and Giants have also been involved in talks, while the Nationals and Cardinals both have rather limited interest. More trade buzz about Jose Quintana. Speculation about the left-hander’s future has become even more intense since the White Sox dealt Chris Sale. Conflicting reports this week suggested the Yankees may or may not be pursuing a trade for both Quintana and David Robertson, and New York also reportedly discussed a three-team deal with the White Sox and Pirates (another club interested in Quintana’s services). Rockies linked to Greg Holland. Colorado is the latest team to show interest in the former Royals closer, with one report suggesting that the Rockies offered Holland a multi-year contract. Rockies GM Jeff Bridich didn’t comment on the reported offer, though he did acknowledge that his club “checked in” on Holland. Including the Rockies, that makes a whopping 18 different teams who have shown some degree of interest in Holland as he makes his return from Tommy John surgery. The Pirates have designated outfielder Willy Garcia for assignment, Bill Brink of the Pittsburgh Post-Gazette reports (Twitter link). The move creates roster space for the newly re-signed Ivan Nova. Garcia, who turned 24 in September, has been rated by Baseball America in each of the last two years as the 12th-best prospect in the Pirates’ system. His star may have dimmed, however, following a rough 2016 season that saw Garcia hit only .245/.293/.366 with six homers over 499 plate appearances at Triple-A Indianapolis. Garcia struck out 131 times (against 31 walks), continuing his career-long issues with plate discipline. This problem has offset his other talents, as the 2016 Baseball America Prospect Handbook credits Garcia with strong raw power, above-average baserunning ability and an outstanding throwing arm. Garcia joins another Pirate (Jason Rogers) as one of six players around the league currently awaiting their next assignment, according to the MLB Trade Rumors DFA Tracker. 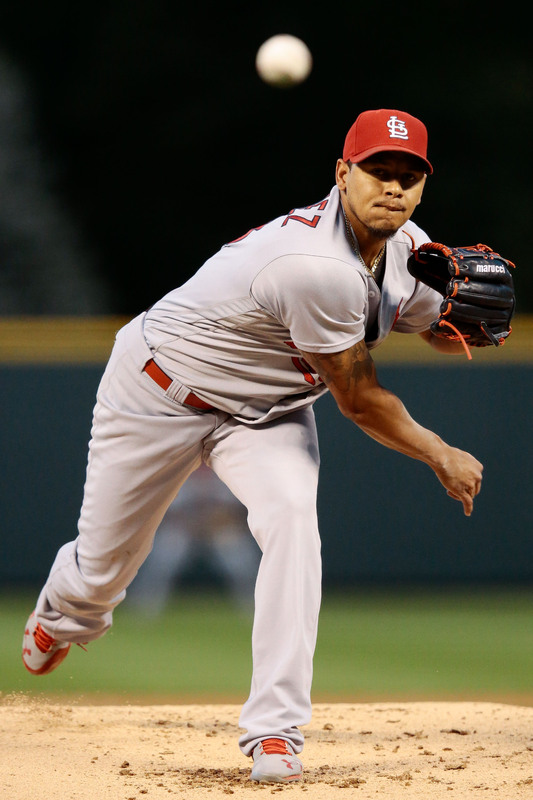 We know that the Cardinals are interested in exploring an extension with righty Carlos Martinez, though there’s no news of progress (or even earnest engagement) to this point. But new contracts are often sorted out during the spring, and the sides will need to discuss money one way or another since Martinez is entering his first season of arbitration eligibility. Only 100 days past his 25th birthday, Martinez is young enough to believe he has plenty of good years ahead of him. He’s also among the game’s hardest-throwing starters. Though his average fastball velocity took a slight step back in 2015, it bounced back to a robust 96.5 mph in his most recent campaign. And the results have followed, as Martinez posted a combined 3.02 ERA over the last two seasons. That combination of age, the liveliness of his arm, and results make the Octagon client an appealing candidate for an investment for a St. Louis club that has faced a few questions in its still-talented rotation of late. Of course, the arbitration process provides an important starting point for weighing Martinez’s value. MLBTR and contributor Matt Swartz project him to earn $5.3MM in his first season of eligibility, a rather lofty sum for a first-year-eligible starting pitcher. (Dallas Keuchel set a new record last year with a $7.25MM deal, blowing away the long-standing $4.35MM record held by Dontrelle Willis and David Price.) If Martinez continues his current trajectory, he could follow Price in landing some truly significant arb salaries, though unlike the talented lefty, he won’t be able to build off of a Super Two campaign. For Martinez to max out his earning capacity, though, he’ll need to extend his outings. He topped 180 innings for the first time in 2016, ending up with 195 1/3 frames on the ledger. Durability will be a key consideration for the Cards. Though there haven’t been any significant health concerns to date, Martinez’s combination of youth and propensity for relying on hard pitches gave him a somewhat elevated Tommy John risk profile in the study completed earlier this year by MLBTR contributor Bradley Woodrum (see here for an explanation; here for individual player results). All told, there’s plenty of reason for confidence in Martinez’s outlook. Increased confidence and usage rates in his changeup — the only one of his four pitches that didn’t score as a top-level offering in 2016 — has allowed him to make strides against lefties, who battered him in 2014. Though he still surrendered a .256/.342/.387 batting line to opposing southpaws in 2016, that’s enough to make him a high-quality starter when combined with his dominating work against right-handed batters (who hit just .204/.270/.269). Though he lost over one strikeout per nine as against his prior season’s results in 2016, and his swinging-strike rate dwindled a bit to 9.4%, Martinez posted a career-best 56.4% groundball rate. He also worked in the zone more than he had in the preceding two years, though his walk rate has remained relatively consistent. Martinez continues to be tough to take deep — he has allowed 0.6 dingers per nine for his career — and has given up hard contact on less than three of ten balls put in play against him in every one of his seasons in the majors. So, assuming that St. Louis is prepared to do what’s reasonably necessary to make a deal, what kind of contract might we be looking at? It has been quite some time since we saw a reasonably comparable pitcher in the 3+ service class strike a long-term deal. Johnny Cueto got $27MM over four guaranteed seasons while giving up one option year, but that was way back in 2011, and his platform wasn’t as impressive. Before that, Ervin Santana earned $30MM in a similarly situated deal. Those numbers seem well shy of what Martinez can command in a market where top-end starters have earned increasingly significant sums. Indeed, the Cards recently reached an arb-only deal with fellow righty Lance Lynn, who took a similarly compelling case into his first year of arbitration eligibility ($5.5MM projection), that priced his arb years at $22MM. For Martinez to give up any free-agent seasons, particularly by way of option, St. Louis will need to up the ante. Expanding the search a bit, there are some other contracts worth considering. Corey Kluber landed $38.5MM over five years, with two options attached, on the cusp of his age-29 season. He was coming off of a Cy Young campaign, and would have qualified for Super Two status after the season in which he signed his deal (which came in early April of 2015). The contract valued Kluber’s bought-out free-agent years at $13MM and between $13MM and $17MM (depending upon escalators). Before that, Chris Sale took down a $32.5MM guarantee on an identical structure. Sale was just 23 years old at the time, and already pitching like an ace; his contract could well represent the tail end of an old model rather than a truly relevant mark going forward. Looking at 4+ service deals, and excepting ace-level performers (Justin Verlander and Felix Hernandez), Matt Harrison owns the high bar in recent contracts at five years and $55MM (plus an option). He was 27 years of age at the time that deal was struck. In Martinez’s case, a five-year arrangement (including the 2017 season) would put him under contract for two would-be free-agent years and take him through at least his age-29 campaign, with options perhaps extending the Cards’ control into his early thirties. Taking Lynn’s $22MM and adding another $25MM or so to cover two free agent years — with Martinez’s age roughly balancing off Kluber’s advantage in quality in pricing those seasons — would put the total guaranteed value to roughly the midpoint between Kluber’s and Harrison’s contract. Arguing for a guarantee that reaches or exceeds Kluber’s could represent a sticking point in and of itself. On the other hand, the Cards have perhaps been more willing to spend big in extensions than have the budget-minded Indians, while Kluber’s meteoric rise at a relatively advanced age made him a unique case. Plus, Martinez can reasonably argue that his age-28 and 29 seasons can be expected to earn him much greater sums than even the numbers just noted; relatively youthful free-agent starters such as Jordan Zimmermann have commanded over $20MM annually. That’s all just a spitball range, of course, and it’s certainly plausible to imagine any number of creative scenarios, including escalators, opt-outs, and options that could play a significant role in determining the final value. Regardless, it’s somewhat uncharted territory; the sides figure to have plenty to talk about over the coming months. With the new year on its way, we’re actually just six weeks or so away from the opening of Spring Training. But there’s plenty of work yet to do on the transactional side. A variety of interesting and useful free agents remain unsigned, and there are certainly some trade scenarios left to explore. Many teams have addressed needs; some, perhaps, have all but completed their offseason work. But there’s always room for improvement, and a few organizations still have significant holes to fill. Second Base: Andrew Friedman and co. aren’t afraid to get creative, and don’t feel compelled to add big names. But the projected second base mix — which might include Enrique Hernandez, Chris Taylor, Austin Barnes, Micah Johnson, and Charlie Culberson — doesn’t appear to hold all that much promise. Los Angeles is rumored to be pursuing a solution, with particularly intense discussion surrounding Brian Dozier of the Twins, so the expectation remains that an outside addition will be made. Left Field: The in-house options are certainly more robust in the corner outfield, but that remains an area that the Dodgers could look to improve — particularly, if the team can find a true difference-maker (all the better if he hits from the right side). If Yasiel Puig remains as a semi-regular option in right, that would leave the other corner spot open to a variety of platoon scenarios, potentially involving Trayce Thompson, Scott Van Slyke, Darin Ruf, or even Hernandez or Culberson from the right side, and Andre Ethier and Andrew Toles from the left. Options? Sure, plenty. But adding an established piece to handle the bulk of the load might not only boost the lineup, but also permit L.A. to carry another of its much-loved flex players. Right-Handed Reliever: This isn’t a pressing need, exactly, but we’ve heard plenty of chatter about possible righty pen pieces — Joe Blanton, especially. Pedro Baez and Chris Hatcher currently rate as the top two right-handed set-up options in front of closer Kenley Jansen, so adding to that group makes quite a bit of sense. Third Base: San Francisco gave up a fairly significant piece to obtain Eduardo Nunez at the trade deadline last year, while shipping Matt Duffy in the trade that brought back Matt Moore. That reshuffling left Nunez as the presumptive man at the hot corner, with postseason hero Conor Gillaspie providing a platoon mate. But it’s certainly fair to argue that the organization could reap significant rewards by adding a bigger bat to play third, bumping Nunez into a super-utility role in which he could provide plenty of value. Left Field: Like the Dodgers, the Giants certainly have internal possibilities to fill the void in left. If a third baseman is ultimately added, that might free Nunez to spend some time there, too. (Then again … just read this.) As things stand, the position will likely be manned by a combination of unproven (albeit fairly well-regarded) players: Jarrett Parker and Mac Williamson. And Gorkys Hernandez remains available as a reserve, too, though he’ll likely supplement Denard Span in center. There are a few familiar names on hand as minor-league free agents, but in the aggregate, there’s a lot of uncertainty. Right-Handed Reliever: The Giants’ pen has a lot of quality arms, despite the struggles in the ninth inning in 2016, and adding Mark Melancon as the closer largely closes the books in terms of needs there. But it never hurts to build depth and create competition, and the Giants could conceivably push pitchers such as Cory Gearrin and George Kontos by adding one or two alternatives. First Base: While Ian Desmond is apparently penciled in at first base, it still seems to make all the sense in the world to add another player there while utilizing Desmond in the outfield. Read here for more on that situation. Right-Handed Reliever: While the Rox are fairly heavily invested in a variety of relievers, the pen remains questionable. That’s most apparent in the team’s lack of right-handed setup options in front of presumptive closer Adam Ottavino. Currently, Jason Motte and Chad Qualls are the only two righties who seem clearly in line for such a role, with players like Jordan Lyles, Carlos Estevez, and Miguel Castro among the other options. Given the team’s investment in Desmond, excellent position-player core, and relatively promising crop of starters, now may be the time to spend a little extra to complete the bullpen. Starting Pitcher: “You can never have too much pitching.” Corollary: especially if you are the Rockies. Colorado likely feels comfortable with at least four of its rotation spots, but bringing in some depth and generating camp competition seems like a worthwhile course given the history of attrition in Coors Field. Investing a bit to fill some innings while reducing pressure on the team’s younger arms could go a long way towards making the Rockies a contender — and even enhancing their mid-term outlook. Left-Handed Reliever: The top two southpaw options in the Arizona pen, presently, are Andrew Chafin and Steve Hathaway. While the former has a fair bit of MLB experience, he was hit hard in the majors last year. And while the latter earned his way to the bigs with a solid minor-league season, and did log 9.2 K/9 over his 14 2/3 MLB frames, he also coughed up eight earned runs in that brief debut. Bottom line: depth, at a minimum, would be desirable. The D-Backs have already shown a willingness to draw a player by offering a role, when they signed Fernando Rodney to step in as the closer, and that approach may pay dividends here as well (even if it means waiting to see what players shake loose during camp). Right-Handed Reliever: While the need isn’t quite as pronounced, perhaps, the right-handed side of the relief corps could also stand to be buttressed. Randall Delgado is a reliable provider of innings, but hasn’t consistently delivered results. Jake Barrett, Enrique Burgos, Silvino Bracho, and Evan Marshall are each intriguing to varying degrees, but still come with uncertainty. With plenty of veteran righties still out there, it’s a fairly easy call to keep pursuing depth. Bench Bat: Much of the position-player side of the roster is accounted for, but the D-Backs could stand to add some pop — or, perhaps, just a useful all-around player who can play multiple roles — to their bench. Yasmany Tomas (defense) and David Peralta (health) come with big questions; other 40-man pieces such as Jeremy Hazelbaker, Ketel Marte, and Socrates Brito have yet to prove they’re capable major leaguers; and additional potential options on hand (lefties Oswaldo Arcia and Zach Borenstein) are equally uncertain. It’s not a pressing need, perhaps, but with a market still loaded with power bats, an interesting opportunity could present itself. Starting Pitcher: True, the Friars already signed Jhoulys Chacin and Clayton Richard. But those two hurlers are arguably their current top starters, which isn’t optimal. There’s a reason, after all, that they were available on such modest contracts. While Luis Perdomo showed quite a bit of promise last year as a Rule 5 pick, it’s perhaps preferable to at least create a situation where he doesn’t have to work at the major league level. And the other potential rotation pieces on the 40-man — Christian Friedrich, Paul Clemens, Cesar Vargas, Zach Lee, and Walker Lockett — are hardly proven commodities. San Diego has been tied to a variety of veteran free agents, including Jake Peavy and Jered Weaver, and could also look into the trade market if an opportunity arises. Shortstop: Luis Sardinas may still be deserving of a shot, but he hasn’t done anything to date to show he’s capable of being an everyday option at short. The other options are wanting, too: while prospect Carlos Asuaje hit well last year at Triple-A, he hasn’t played short since 2014; Jose Rondon reached the majors at just 22 years of age, but didn’t exactly master the upper minors with the bat; 21-year-old Javier Guerra struggled last year at High-A; Jose Pirela was non-tendered and re-signed to a minor-league deal after a poor showing in 2016; and Rule 5 selection Allen Cordoba is as speculative as they come, given that he hasn’t played above the Rookie ball level. Closer: It isn’t strictly necessary for the Pads to add a closer, as they could utilize Brandon Maurer in that role and could welcome Carter Capps back to action at some point in 2016. But there’s little reason not to explore a market that includes several former 9th-inning men who might like a crack at another stint. Pursuing that route in 2016 with Rodney paid dividends when he was flipped over the summer, and the cost of a signing could be recouped by avoiding larger arbitration raises to existing players. It has been a good year to be a left-handed reliever on the free-agent market — even if your name isn’t Aroldis Chapman and you don’t work routinely in the triple digits with your fastball. Brett Cecil and the Cardinals kicked things off with a four-year, $30.5MM pact that even includes no-trade protection. Power southpaw Mike Dunn scored three years and $19MM from the Rockies. And even true LOOGY Marc Rzepczynski scored $11MM over two seasons in his contract with the Mariners. Those big deals suggest that there was plenty of competition in the market, which perhaps bodes well for the best remaining southpaw arms. Two, in particular stand out: Boone Logan, who played most recently with the Rockies, and Jerry Blevins, formerly of the Mets. You could throw Travis Wood into this mix, too, but he may have a somewhat different (if perhaps overlapping) market, since he’s capable of working as a starter. J.P. Howell has also been a quality reliever in recent years, but the soft-tossing southpaw declined last year in run prevention, velocity, and swinging-strike rate, so we’ll leave him out of the mix for this particular look at the relief market. Focusing on Logan and Blevins, a variety of organizations could still be willing to cough up significant guarantees. In the A.L. East, the Orioles are deeper in the right-handed department (other than closer Zach Britton); the Yankees’ top southpaw after Chapman, Tommy Layne, isn’t exactly a late-inning monster; the Blue Jays are thin with Cecil departing (they project to feature Aaron Loup); and even the Red Sox could conceivably enter the picture (though they may feel set with Robbie Ross and Fernando Abad). The West, too, has conceivable suitors: the Astros entered the winter looking for a southpaw to pair with Tony Sipp, the Angels’ top southpaw is the solid but somewhat unexciting Jose Alvarez, and the A’s have made surprising pen investments in the past and would carry Daniel Coulombe as their LOOGY if Sean Doolittle is utilized as a closer (or is traded). Over in the National League, the N.L. East-rival Nationals and Mets could both stand to add late-inning lefties, and the Marlins could as well. Miami has already spent heavily on its pen, and seemingly feels it’s complete, but doesn’t have a high-end lefty after losing Dunn. And the Cubs could stand to buttress their mix after adding swingman Brian Duensing on a modest contract — assuming, at least, that Mike Montgomery isn’t bumped from the rotation by some trade. Apart from the fairly robust remaining need, there’s every reason to believe that both Logan (32) and Blevins (33) have set themselves up for nice contracts. Indeed, they turned in rather similar, rather productive seasons in 2016. Logan finally converted his steadily excellent swinging-strike rate into results, as he posted a 3.69 ERA (while spending half his time at Coors Field) on the back of 11.1 K/9 and 3.9 BB/9 along with a 49.5% groundball rate. And Blevins allowed just 2.79 earned per nine. He also posted 11.1 K/9 while allowing 3.2 free passes per nine innings and generating grounders on 45.8% of the balls put in play against him. Logan worked with an average 93.0 mph fastball but utilized his slider on over half of his deliveries to the plate. That mix enabled him post a personal-best 16.4% swinging-strike rate, which tied him with Andrew Miller for the third-highest mark among southpaws who threw at least thirty innings (trailing only Chapman and Britton). Though he’s less of a power pitcher, and doesn’t get quite as many swings and misses, Blevins’ actually squeezed out a few more strikeouts than did Logan in their most recent seasons. Blevins continued to rely heavily on a cut fastball, his usage of which jumped when he went to the Mets in 2015, and that may have helped him limit the damage when pitching without the platoon advantage. Indeed, Blevins holds the advantage over Logan when facing right-handed hitters. Though his strikeout, walk, and home run numbers weren’t nearly as good as when he did have the platoon advantage, Blevins limited righties to a .172/.266/.345 batting line last year. And he has generally been at least serviceable against them over his career. Logan, on the other hand, shows much more pronounced splits. Opposing righties have posted a big .288/.376/.478 slash against him in 847 total opportunities across his 11 MLB campaigns. Looking at the bigger picture, neither pitcher really stands out. Logan missed some time in 2014 after undergoing surgery for bone chips following the 2013 season, but has generally been reasonably healthy. And Blevins did miss much of 2015 after consecutive forearm fractures, though both were freak instances. Each pitcher has had up years and down years, but their overall arcs aren’t altogether dissimilar. Over their careers, some metrics prefer one to the other (Blevins’s 3.58 FIP tops Logan’s 4.03 mark; Logan’s 3.78 xFIP is better than Blevins’s 3.92 rate). So, it seems like a close call. If you were looking to add a useful southpaw arm to your bullpen, which of these two free agents would you prefer?